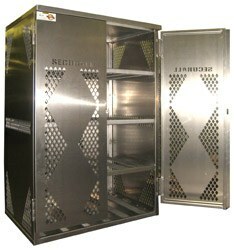 SECURALL Aluminum 12 LP Cylinder Storage Cabinets provide years of reliable outdoor storage with features including: Spark Resistance, Tamper Resistance, Heavy Gauge Design and Weather Discoloring and Corrosion Resistance. All-welded 12-gauge aluminum cabinets are 1/3 the weight of steel models, saving on freight charges. Complies with current OSHA regulations. 15 year warranty.